Few sequences are conserved among the GPCR superfamily, which is often divided into six classes (see GPCR Database available at http:// gpcr.org/). Distinctive structural elements that characterize the three main GPCR families (A, B, and C) are summarized in Fig. 1. 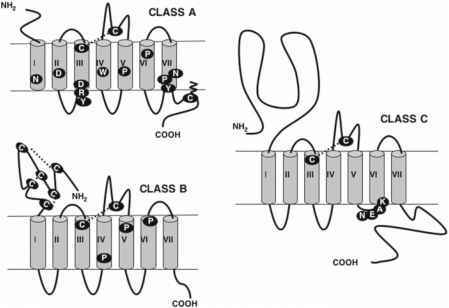 Class A receptors, also called rhodopsin-like receptors, comprise the largest family of GPCRs. This class of receptors binds ligands from various types, including small molecules such as biogenic amines as well as pep-tides (see Subheading 4.). The overall homology among all class A receptors is restricted to a limited number of highly conserved key residues in the transmembrane regions, suggesting a critical role in the structural or functional integrity of the receptor. Ligand binding to class A receptors is discussed in detail in Subheading 4. Class B receptors, also called secretin-like receptors, include about 20 different receptors for various hormones and neuropeptides (2). Ligand binding involves both the N-terminus and extracellular loops of the receptor, and to date, no evidence has been obtained regarding interactions occurring within the transmembrane region of these receptors. Fig. 1. 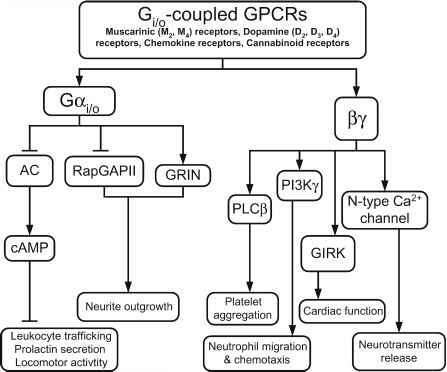 The G protein-coupled receptor (GPCR) main families. A schematic representation is shown for the three main GPCR classes (A, B, and C) with common structural motifs to each family. The only common motif to class A, B, or C GPCRs is a conserved cysteine residue on helix III and another in the second extracellular loop 2. These cysteines are believed to be connected via a disulfide bridge. For class A receptors (rhodopsin-like family), the most conserved amino acid of each helix is indicated. A putative palmitoylation site is represented in the proximal part of the C-terminus The DRY motif on helix III and the NPXXY motif on helix VII are conserved among class A GPCRs (see details in Fig. 2A). Class B GPCRs (secretin-like family) share a large amino terminus with conserved cysteine residues and disulfide bridges. Some proline residues are also conserved within the helical bundle, but those residues are different from class A conserved prolines. Class C receptors (metabotropic glutamate family) are characterized by a very large extracellular domain that binds the ligands. The highly conserved motif NEAK (NDSK in the case of the GABA family) on the very short intracellular loop 3 is indicated. In class C receptors, also known as metabotropic glutamate receptors, ligand recognition is achieved through their very large extracellular domain (300-600 residues). It is organized into two distinct lobes separated by a cavity that binds the ligand in a "Venus flytrap" manner (14). Classes D and E constitute two minor families that are present in fungi and recently the frizzled/smoothened receptor family was added to the world of GPCRs (15). Despite limited sequence homology, class A receptors exhibit identical structural organization, and their overall topography can be subdivided into three main regions (Fig. 2A). On the extracellular side, the N-terminal region is involved in ligand binding (see Subheading 4.) and possibly receptor activation (see Subheading 5.2. ), whereas the extracellular loops represent important key elements for peptide binding and play a role in receptor selectivity toward ligands (see Subheading 4.3.). The transmembrane core is comprised of a bundle of seven a-helices that provide a hydrophobic environment critical for nonpeptide as well as small-peptide ligand binding (see Subheadings 4.1. and 4.2.; Fig. 2B). It relays the conformational changes induced upon ligand binding on the extracellular side of the receptor to the intracellular architectural determinants that regulate activation of the signaling cascade (see Subheading 5.2.). On the intracellular side, the loop regions contain key elements for either direct or scaffolding-protein-dependent interactions with intracellular effectors (see Subheadings 5.4. and 5.5.). Additionally, posttranslational modifications present in the C-terminal are likely to modulate both receptor activation state and G protein coupling (see Subheading 5.3.) as well as to participate in the regulation of receptor internalization and desensitization. Countless studies have been performed on individual receptors that now allow us to draw a fairly consistent picture of the precepts that govern ligand binding to class A receptors. Information on critical determinants has been experimentally obtained using site-directed as well as random mutagenesis, receptor chimeras, and biochemical and biophysical methods. Such experimental data were combined with computer modeling and were used to refine the proposed models. This approach led to an improved template that has been used for ligand-docking studies (3,16). One major outcome was the notion that both the size and nature of the ligand drastically influence the modalities and location of its binding. Hence, only some commonalities may be extracted that are general among ligands or receptors. On the basis of the crystallographical information obtained for rhodopsin, Ballesteros et al. (17) performed a detailed structural comparison of the D2 dopamine receptor with rhodopsin and concluded that the rhodopsin and bio-genic amine receptors may be very similar, despite structural divergence in the transmembrane helical bundle. Indeed, helix kinks at proline (Pro) residues or helix binding or twisting at cysteine, serine, or threonine residues may slightly modify the shape of the ligand-binding pocket and introduce the subtle differences required for class A receptors to bind a structurally diverse collection of ligands. Conserved Pro-kinks in helices V,VI, and VII could adopt different conformations that could significantly change the binding sites of different GPCRs. Nonconserved Pro residues in helices II and IV or nonconserved cysteine/threonine/serine residues in helix III and other helices are another source of potential structural divergence in the binding-site crevice. The authors postulated that GPCRs have evolved in a way that maintains their overall fold by means of alternative molecular mechanisms (structural mimicry) that enable localized variations within their binding sites suitable for recognizing a wide variety of ligands. As a consequence, if the crystal structure of rhodopsin can be used as a template for class A receptor modeling, the particular conformation of the binding site of a given receptor may require substantial refinement to be accurately described at the molecular level. However, some structural elements represent a very specific signature for a receptor family. Catecholamines and related biogenic amines bind primarily within the transmembrane region of their receptors. The identified binding crevice is outlined by residues from helices III, V,VI, and VII. This binding pocket is common to both agonists and antagonists that likely establish a salt bridge with a conserved aspartate residue on helix III at a position analogous to D113 (3.08)1 in the P2-adrenergic receptor (AR). Additional key interactions have also been identified that differ between agonists and antagonists (6,18). 1Amino acids will be referred throughout the text according to the one-letter code. Residue numbering in parentheses corresponds to the nomenclature introduced by Ballesteros and Weinstein for amino acids located in the transmembrane region of the receptor. The first number refers to the helix on which the residue is located. The second number indicates the position of the residue relative to the most conserved amino acid on this helix to which an arbitrary value of 50 is assigned. Residue 3.44 for example is located on helix III six amino acids before the conserved arginine. Based on the mutagenesis studies performed on GPCRs that bind cationic amine neurotransmitters, the aspartate residue in helix III has become a systematic anchorage point for amine ligands in modeling studies. However, opposite effects were observed when this assumption was tested on the and 5-opioid receptors, leading to the conclusion that the aspartate residue in helix III is required for high-affinity binding of agonists to the ^-opioid receptor, but not the 5-opioid receptor (19,20). Moreover, extensive mutagenesis studies performed on the 5-opioid receptors involving peptides and alkaloids acting as agonists as well as antagonists emphasized that the determinants of the opioid receptor binding pocket differ among ligands, despite the presence of a common subset (21). These data again underscore that, although ligand binding in two closely related receptors shares considerable similarities, it displays (on a very fine scale) many subtle differences that preclude direct extrapolation from one set of data to another. VII are indicated by white diamond symbols. Several other important residues for ligand binding and receptor activation mentioned in the text are also indicated in the figure. (B) Organization of the transmembrane helices as seen from the extracellular side of the membrane. The helices are positioned according to the projection maps of rhodopsin and are believed to be organized sequentially in a counterclockwise manner. Conserved amino acids through class A receptors are indicated. worthy peptides of rather small size ( 40 amino acids) show a mixed binding profile through additional transmembrane anchoring in addition to their primary interaction with the extracellular loops (3,5,23). Studies using point mutants and receptor chimeras clearly showed that the extracellular loops are also involved in receptor selectivity. Extracellular loop 2 appears to be a critical determinant to discriminate among a1-AR subtypes (24). In the case of k-, and 5-opioid receptor types, extracellular loop 1 contains critical elements for ^-selectivity (25), and extracellular loop 2 contains critical elements for K-selectivity (26). Extracellular loop 3, together with the external parts of helices VI and VII, is involved in 5-ligand selectivity by enhancing the affinity of the receptor for 5-ligands (25,2729). Additionally, this region also contains important determinants for agonist selectivity (30) and for K-selective alkaloids (28). 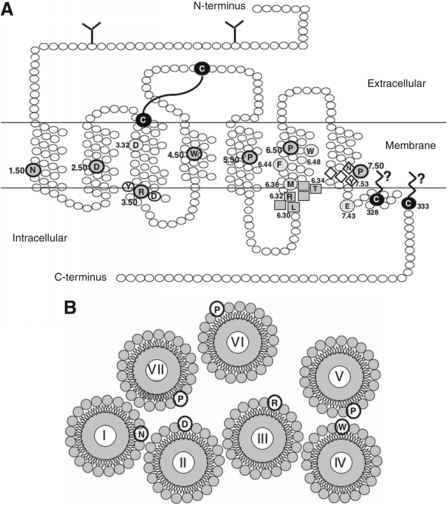 Although binding of small ligands within the transmembrane core of the receptor is widely acknowledged, a possible involvement of the second extracellular loop has also been proposed for small ligands; however, this involvement is still under debate. Interestingly, two antagonists of the a1a-AR, phentolamine and WB4101, exhibit unusual binding features in which three amino acid residues localized in extracellular loop 2 appear to be critical. This observation suggests a binding profile involving extracellular regions of the receptor that is more similar to what has been described for peptide hormone receptors (24). In the high-resolution bovine rhodopsin structure, the second extracellular loop folds down into the binding-site crevice to form a lid over retinal (12), and one may postulate a similar extracellular loop 2 structure exists in at least some class A receptors. Using the substituted-cysteine accessibility method (SCAM), Shi et al. (31) concluded that this may indeed be the case for the D2 dopamine receptor. Another argument in favor of a critical role for extracellular loop 2 comes from the observation that several antibodies directed to extracellular loop 2 induced AR and bradykinin receptor (BR) activation (32). Nearly all class A receptors show the presence of two conserved cysteine residues that are believed to form a disulfide bridge connecting helix III and extracellular loop 2. However, the actual presence of the bridge has been established only in a limited number of cases, including rhodopsin (12), ^-opioid (33), leukotriene LTB4 (34), muscarinic ml (35), platelet thromboxane (36), TSH (37), or gonadot-ropin-releasing hormone (GnRH) (38) receptors. This disulfide bond may be crucial for both the structural integrity and function of many GPCRs. Its removal by mutagenesis severely disrupted ligand binding to muscarinic acetylcholine (35), opioid (33), and angiotensin (AT)1 (39) receptors and destabilized the high-affinity state of the P2-AR (40). The disulfide bridge likely dictates a relatively rigid architecture by constraining the extracellular loop. This, in turn, shapes the ligand-binding site, rather than contributing directly to ligand binding. Interestingly, antagonists are small molecules that invariably bind within the transmembrane region of class A GPCRs. They prevent agonist binding and subsequent receptor activation whether the agonist is a peptide or a small molecule. The generic antagonist binding pocket is located in a region flanked by helices III, V, VI, and VII, in which residues establish the main side-chain interactions with the ligand (6,17,18). Receptor contacts with peptide agonists and nonpeptide antagonists do not substantially overlap at atomic levels in the tachykinin receptor NK1 (18,41), ATI (3), or opioid receptors (21). Therefore, competitive antagonism would primarily arise from a steric exclusion mechanism (3,18).